The Chiang Mai Initiative Multilateralisation (CMIM) is a multilateral currency swap arrangement among ASEAN+3 members, which came into effect on 24 March 2010. Its core objectives are (i) to address balance of payment and/or short-term USD liquidity difficulties in the ASEAN+3 region, and (ii) to supplement existing international financial arrangements. The contracting parties to the CMIM Agreement comprise the finance ministries and central banks of ASEAN+3 Countries (Brunei Darussalam, Cambodia, China, Indonesia, Japan, Korea, Lao PDR, Malaysia, Myanmar, Philippines, Singapore, Thailand, Vietnam), and Hong Kong Monetary Authority of Hong Kong, China. In 2000, in the wake of the Asian Financial Crisis, ASEAN+3 financial authorities decided to strengthen their financial cooperation through the establishment of the Chiang Mai Initiative (CMI), comprising a network of bilateral swap agreements among members. In 2010, the CMI was multilateralized into a single contractual agreement called the CMIM Agreement and the total size of the CMIM facility was expanded and established at USD 120 billion. The evolution of the CMI into the CMIM marked an important milestone, exemplifying the members’ strong commitment to continuously improve and promote financial stability in the region. The CMIM was further strengthened in 2014 by doubling the size to USD 240 billion, increasing the CMIM-IMF De-linked Portion to 30%, and extending the maturity and supporting periods. A crisis prevention facility, CMIM Precautionary Line (CMIM-PL), was also introduced, in addition to the existing CMIM Stability Facility (CMIM-SF) for crisis resolution function. Since then, the CMIM members have repeatedly affirmed their commitment to further strengthen the CMIM as part of the regional financial safety net. The CMIM has been further enhanced through conducting test runs, revising the Operational Guideline, conducting the periodic review, developing the peacetime checklist, and so on. The total size of the CMIM is USD240,000,000,000 (two hundred forty billion). The two countries will be appointed to coordinate the swap activation process when a request for a drawing is made. Two Coordinating Countries shall be the two co-chairs of the ASEAN+3 Finance Ministers and Central Bank Governors Process, one Coordinating Country from ASEAN member countries and the other from China, Japan, and Korea. Fundamental issues (such as the total size of the CMIM, contribution of each CMIM party etc.) for the CMIM would be determined by a consensus approval at the Ministerial Level Decision Making Body (MLDMB), which consists of ASEAN+3 Finance Ministers and Central Bank Governors. In the case of the actual balance of payments and/or short-term liquidity difficulties, any central bank of ASEAN+3 countries as well as Monetary Authority of Hong Kong, China, is entitled to request a swap of their local currencies with the US dollar for an amount up to their contribution multiplied by their respective purchasing multiples under the “CMIM Stability Facility (CMIM-SF). IMF-Linked Portion: If a CMIM-SF arrangement is linked to an IMF program, each drawing shall mature one year after the date of drawing with two renewals, totaling up to 3 years in supporting period. IMF De-linked Portion: If it is not linked to any IMF program, the drawing can be made up to 30 percent of each CMIM party’s swap quota or maximum arrangement amount and the maturity shall be six months with three renewals, totaling up to 2 years in supporting period. The CMIM Precautionary Line (CMIM-PL) is a simplified crisis prevention facility, which was introduced in 2014. The ELDMB may flexibly apply the five qualification criteria below, as ex-ante qualifications, and ex-post conditionality after considering the economic reports by the requesting country and analyses by AMRO/ADB/IMF as the basis for the decision. Duration of access for CMIM-PL arrangements is six months with three renewals, totaling two years in arrangement period. The total amount that can be drawn by each member country, either for prevention or resolution purposes, should be within the maximum swap amount set aside for that country. Dual-drawing from both the CMIM-SF and the CMIM-PL is restricted. The CMIM-PL can be replaced with the CMIM-SF if any CMIM-PL recipient party is hit by crisis and needs additional support, depending on the decision made by the ELDMB. The CMIM party that requests the CMIM arrangements needs to meet a set of conditions precedent before the ELDMB members take a vote on whether to approve such request, including completion of review of the economic and financial situation and no events of default, among others. Each CMIM party is requested to comply with covenants such as submission of the periodic surveillance report and participation in the ASEAN+3 Economic Review and Policy Dialogue (ERPD). The reform of the international financial architecture is now being pushed forward by the G20, with a focus on further strengthening the Global Financial Safety Net (GFSN) with the IMF at its center. Stronger cooperation among the different layers of the GFSN is crucial to prevent and contain future crises and safeguard global financial stability. Against this backdrop, the ASEAN+3 members decided to carefully study how the CMIM can be better integrated into the global financial safety net. To this end, joint test runs have been conducted in collaboration with the IMF since 2016. During and after the first Periodic Review, in order to ensure consistency with the IMF, an information sharing coordination process in the form of Operational Guidelines will be duly established to have a shared view on economic and financial situations, financing needs, and policy recommendations for co-financing. Supporting the implementation of the CMIM is one of AMRO’s core functions. AMRO’s effort has centered on providing support to members on the following aspects to enhance the CMIM’s operational readiness. With support from AMRO, the CMIM is now equipped with the Operational Guidelines specifying relevant activation procedures, which will be updated along with test runs and periodic reviews. Members have regularly conducted test runs under various scenarios since 2013, especially joint test runs with the IMF since 2016. This was drawn up and has been checked regularly in order to monitor the member authorities’ preparation for CMIM activation in accordance with the CMIM Agreement and Operational Guidelines. AMRO has supported members to develop and enhance the ERPD Matrix to act as qualification criteria and methodology for the CMIM-PL. AMRO supported members in the first five-year Periodic Review through identifying and addressing key issues as well as consolidating points raised at the CMIM test runs evaluation sessions. A general agreement on the main contents has been reached among members. AMRO has also provided intellectual and administrative support to further strengthen the CMIM with the development of the CMIM conditionality framework and the facilitation of CMIM’s collaboration with other international financial institutions. Regional Financial Arrangement (RFAs) are mechanisms or agreements through which groups of countries mutually pledge financial support to countries experiencing financial difficulties in their regions. There are eight RFAs across the world and the CMIM/AMRO is the one for the ASEAN+3 region. Together they are the regional line of defense in the Global Financial Safety Net, whose other components are national foreign exchange reserves, bilateral swap lines between central banks, and the IMF. RFAs were typically set up in response to different types of crises, ranging from a currency crisis to a sovereign debt crisis, to bank runs. This explains the wide variety in history, size, operating methods and experience of the world’s RFAs. Cooperation between RFAs – and between RFAs and the IMF – is crucial to limit the worst effects of any next crisis. The G20 has urged such cooperation at several Summits, including in its most recent statement. To that end, the first RFA High-Level Dialogue on the role of RFAs was held in 2016 in Washington, DC. There, participants agreed to hold a Joint RFA Research Seminar on an annual basis. The first seminar jointly organised by AMRO, the European Stability Mechanism (ESM), and the Fondo Latinoamericano de Reservas (FLAR), was held in September 2017 in Singapore. Together with these two annual events, several initiatives and joint research have been put in place to enhance RFAs’ capacities; strengthen cooperation among RFAs themselves and between RFAs and the IMF. The information below is extracted from the Joint Statement of the 21th ASEAN+3 Finance Ministers’ and Central Bank Governors’ Meeting (May 4, 2018, Manila, Philippines). To read the full statement, click here. We [the Finance Ministers and Central Bank Governors of ASEAN, China, Japan and Korea (ASEAN+3)], reaffirm our commitment to strengthen the CMIM and have reached a general agreement on the main contents of the first CMIM Periodic Review. This Review will be a key milestone in further strengthening the CMIM, which stands at the center of the regional financial safety net of the ASEAN+3. In this regard, we have agreed to reinforce the financial support including the flexibility to extend periods under the IMF-linked portion of the CMIM Agreement in order to ensure that the CMIM remains up-to-date, and reflective of the member countries’ circumstances, as well as global economic and financial conditions. We have also agreed to add an overarching legal basis for conditionality in order for the CMIM to support members in addressing their risks and vulnerabilities through policy recommendations as well as financial support (please see Annex below). We urge the Deputies to prepare the final text of the amended CMIM Agreement within this year for signing so that it can be executed at the earliest opportunity. We acknowledge that in an increasingly integrated global financial system, stronger cooperation among the different layers of the GFSN (Global Financial Safety Net) is crucial to prevent and contain future crises and safeguard global financial stability. We welcome the successful completion of the 8th test run carried out with the participation of the IMF, subsequent to the previous year, in which information-sharing process relating to the activation of the CMIM arrangement with the IMF program was examined. It highlighted the importance of better cooperation with the IMF, while respecting the independence and governance of the CMIM and the IMF. Based on the outcome of the test run, we encourage close engagement at an early stage between the CMIM and the IMF, with the support of AMRO, to enhance effectiveness of the regional financial safety net. We appreciate the support of the IMF in the recent test run. We believe that strengthening communication with all relevant parties, including the media, will enhance public confidence if and when the CMIM Arrangement is activated. In addition, we request the Deputies to continue to discuss and review the future direction of the CMIM in the medium-to long-term perspective and report the progress at the next meeting. We further welcome the continued work of our Deputies to further enhance the operational readiness of the CMIM including updating the CMIM Operational Guidelines (OG) and conducting further test runs jointly with the IMF. We acknowledge the progress made in improving the qualification criteria for the CMIM Precautionary Line, by enhancing the Economic Review and Policy Dialogue (ERPD) Matrix framework, which will be integrated into AMRO’s surveillance work. We encourage the Deputies, in cooperation with AMRO, to conduct a new round of pilot projects and look forward to the 9th CMIM test run in 2018 jointly with the IMF. We welcome the advancements made in developing the CMIM Conditionality Framework, and look forward to further progress in the development of the Guiding Principles and the Operational Guidelines for the CMIM Conditionality Framework. We look forward to further enhancements on the assessment methodology on the potential increase of the IMF De-linked Portion. The CMIM Parties have agreed to improve the CMIM financing terms in order to strengthen their support for members. Specifically, the length of the CMIM supporting periods has been made flexible by increasing the maximum number of renewals from two times to multiple times if and when necessary in the case of the IMF Linked Portion. As a result of this amendment, CMIM Arrangements can be provided for more than three years in the case of the IMF Linked Portion. This may also provide a modality for financing assurances for co-financing operations. It is acknowledged that close cooperation and coordination with the IMF is critical to prevent and/or resolve future crises in the region. In this regard, in order to ensure consistency with the IMF, a coordination process in the form of Operational Guidelines (OG) will be duly established to have a shared view on economic and financial situations, financing needs, and policy recommendations for co-financing. The modalities of early information-sharing will be aligned with this coordination process. Engagement at an early stage may facilitate smooth collaboration, help address differences and allow the formation of a common view on key parameters and policies, while the CMIM and the IMF will continue to form an independent view on their respective financing decisions. The CMIM Parties have agreed to add an overarching legal basis for conditionality, in addition to the existing one for crisis prevention, as an applicable provision for the CMIM Arrangement for crisis resolution. It is expected that the CMIM may further support members by helping in the design and implementation of appropriate economic and financial policies, which in turn can make members overcome a crisis more quickly and settle on a sustainable path of economic growth. In joint financing programs with the IMF, it is now explicit that conditionality of the approved CMIM Arrangement shall be consistent with the IMF-supported Program, through early information-sharing and engagement and collaboration based on one coherent program. The program review process is reinforced by identifying the issues to be reviewed and monitored after a CMIM Arrangement is approved. For co-financing, program reviews and disbursements based on such a review by the CMIM and the IMF can be better coordinated with the IMF-supported Program. A series of financing conditions have been upgraded consistent with the relevant IMF-supported Program. For example, it has been agreed in the case of the IMF Linked Portion, flexibility will be applied to the schedule of disbursement, subject to the decision made by the ELDMB (Executive Level Decision Making Body). If necessary and available, some CMIM-related information can be disclosed for media coverage to bolster market confidence when the CMIM is activated and also be shared with third parties, including the IMF, subject to the decision made by the ELDMB and the consent of the Arrangement Requesting Party. The information below is extracted from the Joint Statement of the 20th ASEAN+3 Finance Ministers’ and Central Bank Governors’ Meeting (May 5, 2017, Yokohama, Japan). To read the full statement, click here. We [the Finance Ministers and Central Bank Governors of ASEAN, China, Japan and Korea (ASEAN+3)] affirmed our commitment to further strengthen the CMIM as an essential part of the regional financial safety net. In this regard, we welcomed the revision of the CMIM Operational Guidelines to clarify the activation process of the IMF De-linked Portion of the CMIM, as well as the progress in the preparation of the CMIM Conditionality Framework. We also welcomed the Deputies’ endorsement of the assessment methodology on the increase in the IMF De-linked Portion. We appreciated all these efforts and the significant progress that has been made in working towards the potential increase of the IMF De-linked Portion. We look forward to further progress on this issue. It is encouraging to note that the CMIM, with its current size of USD 240 billion, is at the center of our regional financial safety net, complemented by the network of bilateral swap arrangements in the region amounting to more than USD 160 billion. We welcomed the development of the qualification indicators for the CMIM-Precautionary Line, based on the Economic Review and Policy Dialogue (ERPD) Matrix, that consists of key economic and financial indicators of all ASEAN+3 member economies. We look forward to the successful completion of the pilot project for the ERPD Matrix peacetime procedure and progress on ERPD Matrix indicators and benchmarks, in cooperation with AMRO. We noted that the CMIM also contributes to a stronger global financial safety net with the IMF at its center. In this regard, we welcomed the successful completion of the 7th Test Run which examined the activation of the CMIM arrangement with the IMF program. It has highlighted the importance of improving CMIM’s readiness and effectiveness by (i) addressing issues that are fundamental to the CMIM, (ii) improving CMIM-IMF coordination (including burden sharing, financing conditions and information sharing), and (iii) enhancing AMRO’s capacity. These important works have been included in our plan on the Periodic Review of the CMIM Agreement, and we look forward to strong progress towards this direction by our next meeting, including the reports from the two Working Groups (WGs), one on CMIM fundamental issues and the other on the coordination with IMF. We will deepen our engagement with the IMF with the aim of resolving operational issues that may arise in order to further strengthen the supplementary role of the CMIM in the global financial safety net. The information below is extracted from the Joint Statement of the 19th ASEAN+3 Finance Ministers’ and Central Bank Governors’ Meeting (May 3, 2016 Frankfurt, Germany). To read the full statement, click here. We [the Finance Ministers and Central Bank Governors of ASEAN, China, Japan and Korea (ASEAN+3)] affirmed our commitment to further strengthen the CMIM as an essential part of the regional financial safety net. In this regard, we welcomed the progress made on enhancing the CMIM Operational Guidelines (OG), conducting regular CMIM Test Runs under various scenarios, and undertaking the CMIM peace-time preparation activities to ensure the operational readiness of the CMIM, including the activation process of IMF delinked portion, with AMRO’s support. We look forward to the recommendation of the taskforce in November 2016 on the potential increase in the IMF delinked portion. Against the backdrop of the reform of the international financial architecture now being pushed forward by the G20, including further strengthening the global financial safety net with the IMF at its center, we tasked the Deputies to carefully study how the CMIM can be better integrated into the global financial safety net. To this end, we welcomed a Test Run to be conducted this year on the crisis resolution facility linked to the IMF program. We welcomed the continued work of our Deputies and AMRO to further develop the qualification indicators for the CMIM Precautionary Line (CMIM-PL), based on the Economic Review and Policy Dialogue (ERPD) Matrix, which consists of key economic and financial indicators of all ASEAN+3 members. We tasked the Deputies, in cooperation with AMRO, to continue to develop the ERPD Matrix and to explore ways to further utilize this tool in a more forward-looking manner. We supported the timely conclusion of the periodic review of the CMIM Agreement. In view of this, we recognized that some aspects in the CMIM fundamental issues should be further clarified in the CMIM Agreement based on the lessons learnt from the previous peace-time preparation and Test Runs. We welcomed the Deputies’ endorsement of the priority order and work schedule for the CMIM fundamental issues, and tasked the Deputies to work out solutions on the relevant issues following the agreed timetable. We noted the completion of the CMIM Studies on “Troika’s Financial Assistance Programs in the Euro Area for CMIM’s Future Reference” and “Comparative Analysis of CMIM Arrangement and Market Practices”. The information below is extracted from the Joint Statement of the 18th ASEAN+3 Finance Ministers’ and Central Bank Governors’ Meeting (May 3, 2015, Baku, Azerbaijan). To read the full statement, click here. We [the Finance Ministers and Central Bank Governors of ASEAN, China, Japan and Korea (ASEAN+3)] remain committed to ensuring that the CMIM is operationally ready, as well as to further strengthening the mechanism as an essential part of the regional financial safety net. In this regard, we welcomed the amended CMIM Agreement, which entered into force on 17 July 2014. We also welcomed the Deputies’ achievements in enhancing the CMIM Operational Guidelines (OG), conducting CMIM Test Runs under various scenarios, and undertaking the CMIM peace-time preparation exercise. We reaffirmed our commitment to ensuring the operational readiness of the CMIM, and thus tasked the Deputies, in cooperation with AMRO, to continue working on these exercises, and to reflect the lessons learnt in the OG. With the introduction of the CMIM crisis prevention facility (“CMIM Precautionary Line” or “CMIM-PL”) in July 2014, it is crucial to develop and operationalize the qualification assessment framework for member economies to access the CMIM-PL. In this regard, we welcomed the continuing work of our Deputies and AMRO to further develop the qualification indicators for the CMIM-PL, based on the Economic Review and Policy Dialogue (ERPD) Matrix, which consists of key economic and financial indicators of all ASEAN+3 members. We assigned the Deputies, in cooperation with AMRO, to continue to develop the ERPD Matrix and to explore ways to further utilize this tool in a more forward-looking manner. We took note of the progress in the work on the potential increase in the IMF De-linked portion and tasked the Deputies to further advance the work on strengthening the CMIM as a part of the regional financial safety net. We welcomed the commencement of the CMIM Studies on “Troika’s Financial Assistance Programs in the Euro Area for CMIM’s Future Reference” and “Comparative analysis of CMIM arrangement and market practices under International Swaps and Derivatives Association (ISDA)” while taking into account the conditions within each region. The information below is extracted from the Joint Statement of the 17th ASEAN+3 Finance Ministers’ and Central Bank Governors’ Meeting (May 3, 2014, Astana, Kazakhstan). To read the full statement, click here. We [the Finance Ministers and Central Bank Governors of ASEAN, China, Japan and Korea (ASEAN+3)] reaffirm our commitment to further strengthen the CMIM as part of the regional financial safety net. We welcomed the report of our Deputies on the progress made to prepare during peace times to ensure that the CMIM is operationally ready. In particular, we welcomed the Deputies’ achievements in completing the revision of the Operational Guidelines of the amended CMIM Agreement which contain the detailed arrangements for the operationalization of the CMIM. We instructed the Deputies, in cooperation with AMRO, to continue developing the CMIM operational readiness. We welcomed the work of our Deputies to develop the first full set of indicators of the “Economic Review and Policy Dialogue (ERPD) Matrix” which consists of various economic and financial indicators of all ASEAN+3 members. The ERPD Matrix is intended to be used to assess members’ qualification for the CMIM’s crisis prevention facility. We instructed the Deputies, in cooperation with AMRO, to continue developing the matrix and to elaborate the ways the matrix will be used to assess a member’s qualification for the CMIM crisis prevention facility. We also agreed to endorse the “Guidelines for the further cooperation with the International Monetary Fund” to help enhance CMIM’s effectiveness and AMRO’s capacity. We took note of the progress in the study on “Ways to Improve the Use of Local Currencies under the CMIM” and “Joint Response to the Capital Flows at the ASEAN+3 Level”. The information below is extracted from the Joint Statement of the 16th ASEAN+3 Finance Ministers’ and Central Bank Governors’ Meeting (May 3, 2013, Delhi, India). To read the full statement, click here. We [ the Finance Ministers and Central Bank Governors of ASEAN, China, Japan and Korea (ASEAN+3)] appreciated the work done by our Deputies to amend the CMIM Agreement to reflect the measures to strengthen the CMIM as agreed in May 2012. In this connection, the Finance Ministers welcomed the Central Bank Governors’ involvement in the fundamental decision making process of the CMIM. At the same time, we remain committed to ensuring that the CMIM is operationally ready, and we instructed the Deputies to continue work on the necessary revisions of the current CMIM Operational Guidelines by the next ASEAN+3 Finance Ministers and Central Bank Governors’ Meeting in 2014. We welcomed the work of our Deputies and AMRO to develop the “Economic Review and Policy Dialogue (ERPD) Matrix”. The matrix will consist of economic indicators of all ASEAN+3 members and will facilitate the assessment of members’ qualification for the CMIM’s crisis prevention facility. We instructed the Deputies and AMRO to continue work on the ERPD Matrix for the smooth implementation of the CMIM should the need arise. We reaffirmed our commitment to further strengthening the CMIM as part of the regional financial safety net. Recognizing that enhancing the use of local currencies for settlement in trade, investment and capital transactions, and reducing the volatility of capital flows in and out of the region would help mitigate the impacts of external risks, we endorsed further studies on “Ways to Improve the Use of Local Currencies under the CMIM” and “Joint Response to the Capital Flows at the ASEAN+3 Level”. We instructed the Deputies to consider ways to seek an effective cooperative relationship with the International Monetary Fund (IMF) and other multilateral financial institutions in the areas of surveillance, liquidity support arrangement and capacity development. The information below is extracted from the Joint Statement of the 15th ASEAN+3 Finance Ministers’ Meeting (May 3, 2012, Manila, Philippines). To read the full statement, click here. We shall continue to engage the IMF in the areas of surveillance, financial safety net and capability development. We requested the Deputies to work out necessary revisions of the current CMIM Agreement and the Operational Guidelines by the upcoming November Deputies’ Meeting to reflect these agreements. 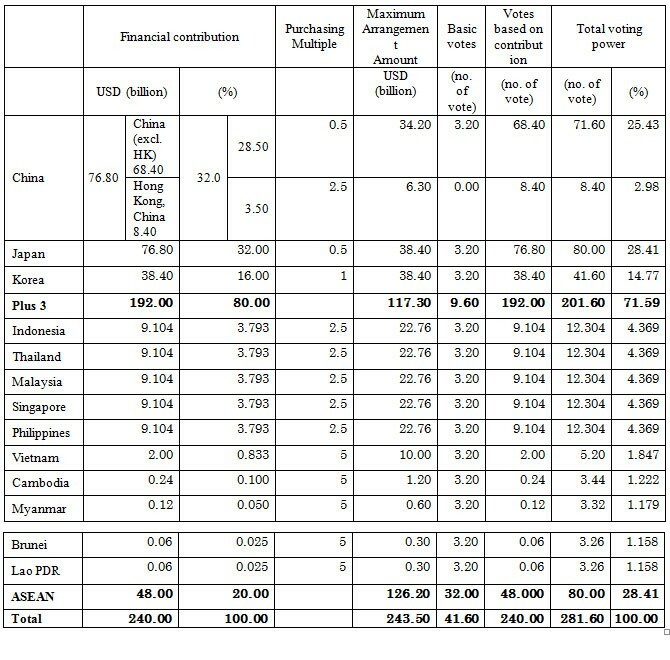 The information below is extracted from the Joint Statement of the 14th ASEAN+3 Finance Ministers’ Meeting (May 4, 2011, Ha Noi, Viet Nam). To read the full statement, click here. We [the Finance Ministers of ASEAN, China, Japan and Korea (ASEAN+3)] endorsed the “Operational Guidelines for Enhancing Effectiveness of CMIM”, which is the operational manual for the currency swaps made pursuant to the CMIM Agreement, including the CMIM’s activation process in relation to the existence of the IMF Programs. We believe that these Guidelines will contribute to swift and smooth activation of CMIM Agreement. We welcomed the establishment of AMRO, which, as the surveillance unit of CMIM, plays an important role to monitor and analyze regional economies, and to contribute to early detection of risks, swift implementation of remedial actions, and effective decision-making of CMIM. We expect AMRO to be fully operational soon, and are committed to promote the smooth and efficient operation of AMRO. We instructed the Deputies to review AMRO’s organizational capacity at the next Deputies’ meeting so that AMRO could fully meet its objectives. We also instructed the Deputies to launch a study to strengthen the legal status of AMRO to constitute an international organization with an international legal personality. We shared the view that, under the current global financial environment, crisis takes place on a global scale and it spreads in a short period of time. It has demonstrated the importance of crisis prevention measures to deter contagion. Considering that the regional financial arrangement needs to be adapted to this new environment, we instructed the Deputies to initiate a study on the design of a possible crisis prevention function for CMIM, including the size, further collaboration with the IMF, and the role of AMRO. The information below is extracted from the Joint Statement of the 12th ASEAN+3 Finance Ministers’ Meeting (May 3, 2009, Bali, Indonesia). To read the full statement, click here. On the Chiang Mai Initiative (CMI), we [the Finance Ministers of ASEAN, China, Japan and Korea (ASEAN+3)] have reached agreement on all the main components of the CMIM, including the individual country’s contribution, borrowing accessibility, and the surveillance mechanism. The agreed components of the CMIM, which is a framework of mutual assistance among ASEAN+3 countries, are consistent with its two core objectives : (i) to address short-term liquidity difficulties in the region and (ii) to supplement the existing international financial arrangements. We agreed to implement the CMIM before the end of this year. In this regard, we tasked our Deputies to work out the operation details and implementation plan, particularly the legal documents that will govern the CMIM. The information below is extracted from the Joint Media Statement, Action Plan to Restore Economic and Financial Stability of the Asian Region. To read the full statement, click here. The information below is extracted from the Joint Statement of the 11th ASEAN+3 Finance Ministers’ Meeting (May 4, 2008, Madrid, Spain). To read the full statement, click here. On the Chiang Mai Initiative (CMI), we have been carrying out work on the key elements of the multilateralisation of the CMI since our last Meeting in Kyoto, following the principle agreement that a self-managed reserved pooling arrangement governed by a single contractual agreement is an appropriate form of multilateralisation. We reiterated our commitment to maintain the two core objectives of the CMI: (i) to address short-term liquidity difficulties in the region and (ii) to supplement the existing international financial arrangements. We agreed that CMI Multilateralisation will be underpinned by rigorous principles to govern its key aspects, including economic surveillance, borrowing accessibility, activation mechanism, decision making rules and lending covenants, while keeping to timely disbursement. The information below is extracted from the Joint Statement of the 10th ASEAN+3 Finance Ministers’ (May 5, 2007, Kyoto, Japan). To read the full statement, click here. On the Chiang Mai Initiative, we [the Finance Ministers of ASEAN, China, Japan and Korea (ASEAN+3)] were pleased to note that the Bilateral Swap Arrangement (BSA) network has increased to US$ 80 billion, consisting of 16 BSAs among 8 countries. ii) to supplement the existing international financial arrangements. We reaffirmed the importance and necessity of strengthening cooperation on regional surveillance alongside the CMI multilateralisation process based on the Economic Review and Policy Dialogue (ERPD). We welcomed the initial progress made by the Group of Experts (GOE) and the Technical Working Group on Economic and Financial Monitoring (ETWG) on ways to strengthen regional surveillance capacity since their launches after our last meeting in Hyderabad. Further, we agreed to explore ways on how to link these activities with strengthened surveillance within the region. The information below is extracted from the Joint Statement of the 9th ASEAN+3 Finance Ministers’ Meeting (May 4, 2006, Hyderabad, India). To read the full statement, click here. On the Chiang Mai Initiative (CMI), substantial progress has continued to be made. In particular, the strengthening of the regional liquidity support network (also known as “the Second Phase of the CMI Review”), which was initiated at the Jeju ASEAN+3 Finance Ministers’ Meeting 2004, had been successfully completed, as explained below. Here, we [the Finance Ministers of the ASEAN, China, Japan, and Korea (ASEAN+3)] reaffirmed to firmly maintain the CMI’s two core objectives, namely, (1) to address short-term liquidity difficulties in the region and (2) to supplement the existing international financial arrangements. Looking ahead, we tasked the Deputies to set up a “new task force” to further study various possible options towards an advanced framework of the regional liquidity support arrangement (CMI multilateralization or Post-CMI), based upon their exploration during the past year. Moreover, we instructed the Deputies to enhance the regional surveillance capacities. The information below is extracted from the Joint Statement of the 8th ASEAN+3 Finance Ministers’ Meeting (May 4, 2005, Istanbul, Turkey). To read the full statement, click here. On the Chiang Mai Initiative (CMI), we [the Finance Ministers of ASEAN, China, Japan and the Republic of Korea (ASEAN+3)] reaffirmed our resolution to strengthen our self-help and support mechanism in East Asia by making the CMI a more effective and disciplined framework. As a basic principle for the review, we agreed to firmly maintain the CMI’s two core objectives, namely, (1) to address short-term liquidity difficulties in the region and (2) to supplement the existing international financial arrangements. To further enhance the CMI’s effectiveness, we tasked the Deputies to study the various possible routes towards multilateralizing the CMI. The information below is extracted from the Joint Statement of the 7th ASEAN+3 Finance Ministers’ Meeting (May 15, 2004, Jeju, Korea). To read the full statement, click here. On the Chiang Mai Initiative (CMI), we [the Finance Ministers of ASEAN, China, Japan and the Republic of Korea (ASEAN + 3)] are pleased to note the continued expansion of its network of bilateral swap arrangements. Since we last met in Makati City in the Philippines, in August 2003, four more Bilateral Swap Agreements (BSAs) have been concluded. That brings the total number of (BSAs) to sixteen, and the size of the network to USD 36.5 billion. We agreed to undertake further review of the CMI to explore ways of enhancing its effectiveness. A working group will be tasked to conduct the review and report the outcome, by the end of 2004, to our Deputies who will report to us at the next AFMM+3. The information below is extracted from the Joint Statement of the 6th ASEAN+3 Finance Ministers’ Meeting (August 7, 2003, Makati, Philippines). To read the full statement, click here. We [the Finance Ministers of ASEAN, China, Japan and the Republic of Korea (ASEAN + 3)] discussed recent economic and financial developments and policies. We also reviewed the progress of regional financial cooperation initiatives, including, the Chiang Mai Initiative (CMI), Monitoring of Capital Flows, the Early Warning System (EWS) and the Asian Bond Market Initiative (ABMI). On regional financing arrangements, we are pleased to note significant progress since we last met in Shanghai in May 2002. The number of Bilateral Swap Arrangements (BSAs) has doubled from six to twelve, and the size of the network has increased from USD 17 billion to USD 31.5 billion. Four more BSAs (China Indonesia, China-Philippines, Korea-Indonesia and Japan-Singapore)are expected to be concluded before the end of this year. To strengthen the current peer review process, we agreed to implement the recommendations made by the ASEAN+3 Study Group to Examine Ways of Enhancing the Effectiveness of Economic Reviews and Policy Dialogues. We also agreed to set up the ASEAN+3 Finance Cooperation Fund (the Fund) to support our on-going economic review and policy dialogue. The Fund would complement our efforts to enhance the effectiveness of our economic surveillance in support of the CMI and the ABMI. The Fund would be administered by the ASEAN Secretariat. The information below is extracted from the Joint Statement of the 5th ASEAN+3 Finance Ministers’ Meeting (May 10, 2002, Shanghai, China). To read the full statement, click here. On regional financing arrangement, we are pleased that significant progress has been made in the implementation of the Chiang Mai Initiative. To date, six bilateral swap arrangements (BSAs) between Japan-Korea, Japan-Thailand, Japan-the Philippines, Japan-Malaysia, China-Thailand, and China-Japan with a combined size of USD 17 billion, have been concluded and signed. Negotiations on two BSAs between China-Korea and Korea-Thailand are already at an advanced stage while substantial agreements on the two BSAs between Korea-Malaysia and Korea-the Philippines have been reached. Another four BSAs between Indonesia-Japan, Japan-Singapore, China-Malaysia and China-the Philippines have been initiated. In addition, in line with the Chiang Mai Initiative, the existing swap arrangements between Japan-Korea and Japan-Malaysia have been renewed with the combined size of USD 7.5 billion. The information below is extracted from the Joint Statement of the 4th ASEAN+3 Finance Ministers’ Meeting (May 9, 2001, Honolulu, USA). To read the full statement, click here. We are pleased to note the significant progress that has been made in implementing the CMI to further strengthen our self-help and support mechanisms in East Asia. The ASEAN Swap Arrangement, one of the CMI main components, has been enlarged to USD 1 billion effective 17 November 2000 and has as its participants all ASEAN member countries. Regarding the network of bilateral swap arrangements (BSA) and repurchase agreements under the CMI, substantial agreements on the BSA have been reached between Korea-Japan, Malaysia-Japan, and Thailand-Japan. Our senior officials will continue to work towards establishing a network of bilateral swap and repurchase agreement facilities among ASEAN countries, China, Japan and Korea. We agreed that we would review the current main principles of the bilateral swap arrangement under the CMI in three years, taking account of the actual operation of the BSA and other relevant factors. Recognizing the importance of enhanced monitoring of the economic situation in our region in implementing the BSA, we agreed to establish a study group to examine ways of enhancing the effectiveness of our economic reviews and policy dialogues. The information below is extracted from the Joint Statement of the 3rd ASEAN+3 Finance Ministers’ Meeting (May 6, 2000, Chiang Mai, Thailand). To read the full statement, click here. In order to strengthen our self-help and support mechanisms in East Asia through the ASEAN + 3 framework, we recognized a need to establish a regional financing arrangement to supplement the existing international facilities. As a start, we agreed to strengthen the existing cooperative frameworks among our monetary authorities through the “Chiang Mai Initiative”. The Initiative involves an expanded ASEAN Swap Arrangement that would include ASEAN countries, and a network of bilateral swap and repurchase agreement facilities among ASEAN countries, China, Japan and the Republic of Korea.